Bodean: Why's he putting in Dabinsky? Tyler: Because Coach Buck's a moron! I actually saw this before its predecessor ("Angels in the Outfield"), so maybe that makes me biased, but I enjoyed it more. Like "Outfield", it's a really sensitive story about trying to overcome a loss in life. 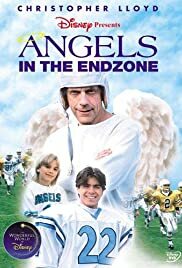 Matthew Lawrence and David Gallagher are great as the two brothers, as is Paul Dooley as the football coach. Another great Disney Channel movie that leaves you feeling good inside.